Very informative, thank you. I think it’s important to recognize that the figure for the employer contribution to insurance premium is the equivalent of a 7.3% raise every year for workers who had employer coverage. 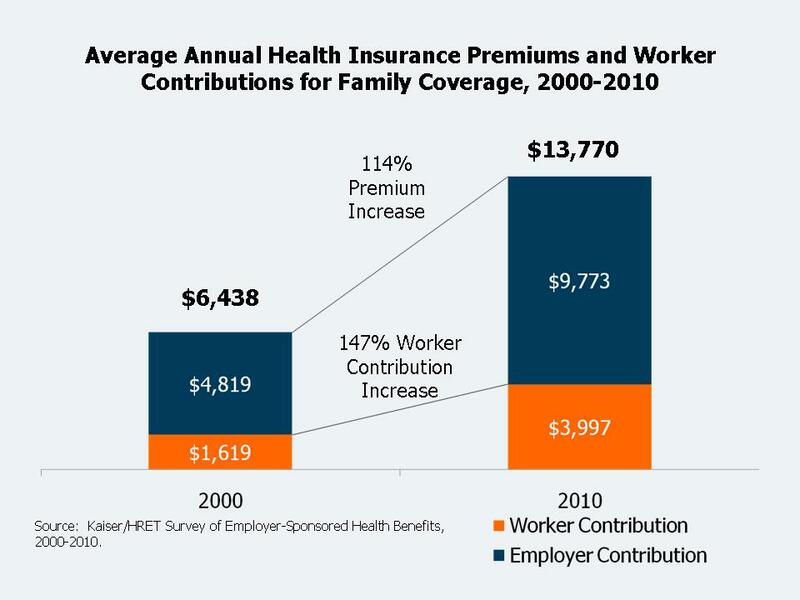 So total compensation for workers who have employer sponsored coverage has been inflating. A significant proportion of total medical expenses occur in the last year of life; i.e. last ditch procedures that fail in the end. I don’t claim to have the answers, but there needs to exist a discussion of the cost/benefit per additional month of life and the quality of that life. End of life healthcare (along with the overall cost to society of an older population) is a very touchy subject and one we are not likely to handle with much grace. If you are interested in an amusing take on this very tough issue check out the book Boomsday by Christopher Buckley. It’s funny and thought provoking. Beyond that, the likely outcome overtime will be that certain end-of-life procedures will not be included in insurance policies subsidized by the government. People will have to purchase seperate “riders” like they do in Canada and Europe. What’s more, the report found that the companies combined earned a total of $12.2 billion last year. And lest we forget, on the executive compensation, CEOs of the top five received $24 million on average in 2008, the report said. You will not find me taking sides one way or another in the insurer v provider blame game regarding medical inflation. It is clear that health insurance costs are rising because demand for healthcare is rising, and as I note above this is largely due to the increase in chronic illness and the ongoing miracles in life-saving performed by the medical profession every day. In reality neither providers nor insurance companies are compensated to manage healthcare costs and medical inflation. It is not part of their business model. In all other industries the management of cost and quality is done by the consumer as part of each and every purchasing decision. We know that individual consumers do not purchase health insurance and many of those that are insured do not perceive themselves as being at risk for the bulk of healthcare expenses. As a result there is no management of rising demand in the healthcare system. As I mention at the end of this post, until 3 things begin to happen, namely consumer engagement, risk management by insurers and alternatives to fee-for-service medicine (the last, in my opinion will be a by-product of the first two), medical inflation will continue, forever. They are effective at insuring everyone, however, they do ration care to control cost. They do not manage risk and they inherently weaken the consumer even more than our current system. Single payer systems world-wide are dealing with healthcare inflation that is as bad as or worse than in the US. I don’t see the single-payer system as a solution to medical inflation. It may be a solution to getting insurance for everyone, however. But if you cannot control the costs in the long run it will be hard to afford meaningful insurance for everyone. I am interested in seeing the US evolve to a system of consumer engagement wherein insurers manage risk and providers deliver optimum care. It will be very hard to get there, but I believe it is possible, particularly as it becomes financially necessary.